Posted on November 21, 2017 by Billy S.
The percent items can replace Radio Button or Dropdown items when the answer affects the order total. 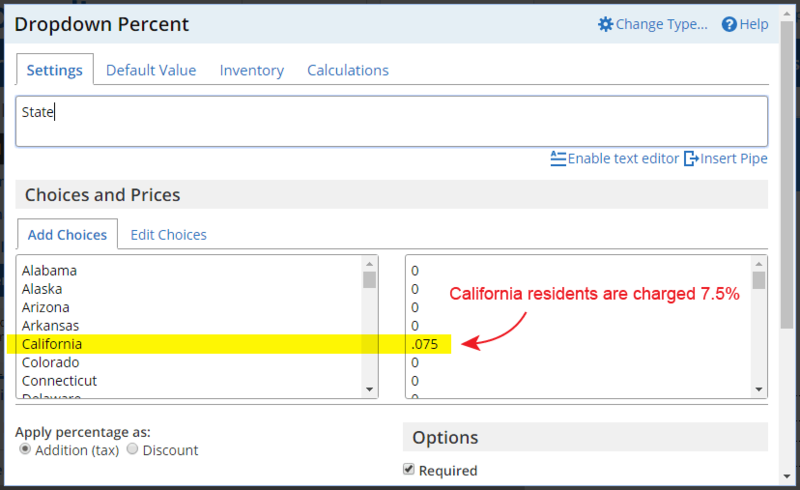 For example, charging tax for a specific state uses a Dropdown Percent item as the State selector, with the tax percentage listed as the corresponding value for the appropriate answer. Rules can be added to the percent items to only show when the conditions are right. 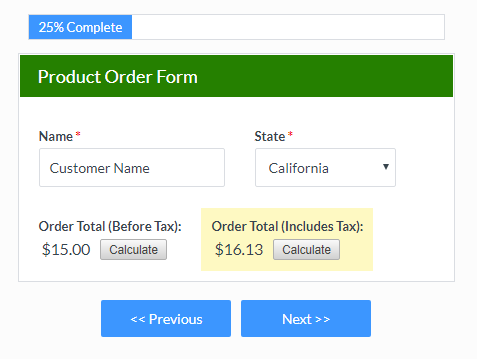 For example, to enable a quantity discount the Scoring feature can be used to track the number of items ordered, then the Radio Button Percent item can be shown when that number exceeds the discount rule. See more about this technique in a previous article. Sometimes there is a need to exclude items from the percentage, like shipping costs or handling fees that are not eligible for tax. In those cases, you can set the pricing item’s setting to Exclude from percentage calculation. To offer a fixed-amount discount, the Coupon Code item is typically used. This item allows the form builder to assign discount amounts to specific codes. If the need is to offer a fixed discount based on quantity or amount, the form can track the quantity or amount using the Scoring technique as described above. 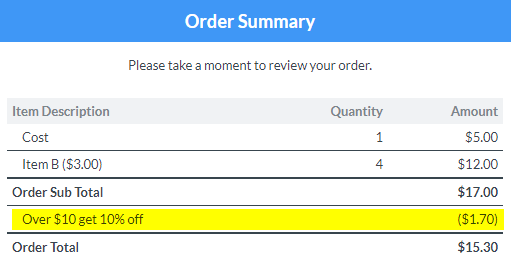 In this case, a regular Text Field Pricing item contains a negative default value to discount a fixed amount.